Oakland First Fridays is an immersive art and community experience on the first Friday of each month from 5:00 p.m. to 9:00 p.m. on Telegraph Avenue from West Grand to 27th Street. Oakland's KONO District springs to life with for this event, with galleries, artist collectives, street artists, local culinary artisans, performers, musicians, dancers, DJ’s, and poets gathering for Oakland First Friday events. Oakland First Fridays’ is produced by the Koreatown Oakland Community Benefit District (KONO), a 501(c)3 nonprofit organization. To preserve Oakland First Fridays as an all inclusive, safe and vital community-driven platform to showcase the emerging artists, makers, gourmet food vendors, musicians, cypher circles (dance battles, spoken word), drumming circles, acrobats, magicians, and many uniquely talented street performers and their audience. We strive to be the premier Oakland First Fridays Event as the epicenter for the community to come together to celebrate, sustain & support the arts. In 2006, a collective of art gallery owners now known as Art Murmur, created-a-once a month art gallery walk which included “The 23rd Street Fair” organized by the Rock Paper Scissors collective. This fair exploded into what is now Oakland First Fridays: the most renowned art, music, food and cultural community event in the Bay Area. In 2013, the KONO Oakland Community Benefit District assumed responsibility for producing the event each month. Oakland First Fridays happens on the first Friday of each month, from 5pm - 9:00pm, on Telegraph Avenue between West Grand and 27th Street. If rain is in the forecast, we make the decision on whether to postpone the Wednesday before, and announce it on our newsletter and Facebook page. Oakland First Fridays hosts a wide array of artists, performer and food vendors, bringing together all that is great about Oakland. Each month has a theme, with family-friendly programming for all. The event highlights are posted to this site and in our monthly newsletter! Our festival is wheelchair accessible and family friendly. People of all ages are welcome to attend. Our events bring over 30,000 attendees, so expect large crowds, and amplified sound from our multiple stage and performance areas. There are Porta Potties available on 23rd St, 24th St, 25th St and 26th St. For exact locations, check out our festival map here. They are but it is not recommended. Our festival is crowded and has amplified music and is not a thing most dogs are going to enjoy. If you bring a dog it must be on a leash and under control at all times. We recommend taking public transportation to Oakland First Fridays. The 19th Street BART station is just a few blocks away. The 12 (Grand Ave. & MacArthur Blvd. ), 51A (Broadway), and 6 (Telegraph Ave.) AC Transit buses also come right to the KONO District. On weekdays and weekend evenings, the free Broadway shuttle runs every 12-15 minutes up and down Broadway from 26th to Jack London. Can I drive to it? Parking is always a challenge in downtown Oakland and it can be very hard to find on a First Friday. Limited street parking is available in the surrounding area, as well as several parking garages. Leaving valuables in your car is not recommended. Per Oakland law, open alcohol containers are forbidden at the event except at our Saki Garden on 23rd street and within local licensed establishments. Violators are subject to citation and/or removal from the festival. Local stores will not provide bags with alcohol purchases during First Fridays. Our ability to put on this festival depends on people obeying the law. Please drink responsibly! We welcome artists, craftspeople, DIYers and food artisans to share and sell their work with the community! You can apply here. Can I just show up to sell my stuff? Our vendor space usually sells out in advance of the festival, if there is space available the day of we will try to accomodate you if you have the proper city paperwork. Out of fairness to the vendors whose fees support the festival, we do not allow unauthorized vending at Oakland First Fridays. How do I perform there? We are always looking for new and emerging talent to perform at Oakland First Fridays! For more info and to apply, visit here. Oakland First Fridays is the most well-attended event in the Bay area, touting an audience of 30,000+ at each festival, as well as lots of local press coverage. If you are interested in becoming a sponsor, we’d love to work with you! Contact sponsors@oaklandfirstfridays.org for more info. Community safety at our events is very important to us. We partner with the Oakland Police Department and VMA Security Group to provide safety and security patrols within and around the festival. To report a crime, you may speak with an Oakland Police Officer, VMA Security staff, visit the security tent at our festival entrance, or notify an Oakland First Friday staff member (identifiable by our neon yellow or orange vests). We advise guests to not leave any valuables in your car or visible from outside your vehicle. Our festival ends at 9:00 pm and we need to clear the streets as quickly as possible so our vendors can pack up and go home. But, there’s plenty to do in Oakland on a Friday night. Visit the “Afterwards” page on our web site for information on events in KONO and all over town. Oakland Art Murmur (OAM) focuses on promoting the awareness, visibility, understanding, and vibrancy of visual art in our wonderful city. OAM strives to increase access to, and participation in, abounding rich and diverse local visual art experiences for the residents of Oakland, the Greater Bay Area, and visitors to our community. OAM’s aim is to aggregate information and to be a resource concerning Oakland’s visual arts for the public and the broader arts community. OAM’s programs include the First Friday Art Walk, The Saturday Stroll and Guided Walking Tours. Visit Oakland Art Murmur’s website to learn more. Oakland First Fridays is one of a diminishing number of economical venues for local artists to sell their wares, and a foodies’ dream! Come join our festival. We’re a project of the nonprofit KONO Community Benefit District, and rely on vendor fees sponsorships and donations to keep the magic happening! 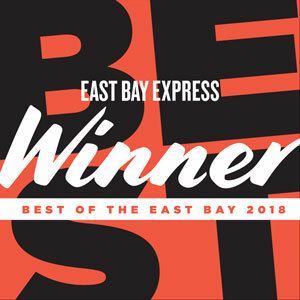 Our event and social media platforms reach tens of thousands of people across the East Bay. See how we can help you promote your business.